What’s that? You don’t want the Ditch Day crossword solution or animated singing gerbils? You want to find out what James Rice’s gerbil Speedy has been up to? As it happens, James is sorry he didn’t have an update ready for the rerun of last weekend’s Speedy photos, but he’s made up for it with this photo essay. Consider it Speedy’s Christmas letter. In honor of the anniversary of the rocket launch, Speedy visited the grave of Miss Baker on the grounds at the U.S. Space & Rocket Center, in Huntsville Alabama. Speedy is contemplating the fragility of life, the advances of science, and how much easier it is to have adventures when not encumbered by mortality. At this very instant, Speedy is spending the winter holidays cruising the Rhine. I am sure more photos and stories will be forth coming, but here is a photo of Speedy putting the moves on a Rhine Maiden named Lorilei, that tries to lure mariners to their deaths in a rapid. Any number of jokes come to mind right now; please leave yours in the comments. The big news, though, is what Speedy did in September. 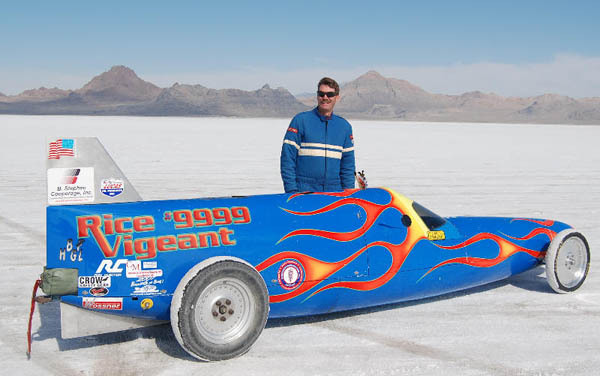 As many readers know, Speedy likes to ride on world speed record attempts at the Bonneville Salt Flats. So far, these have been the fastest motorcycle, diesel truck, electric car, etc. The list goes on and on. This time though, the category was “A-II-6” which means, “Custom car, non-turbo, 1100-1500cc”. This may not sound too impressive, but what made it special was that it was *my* car, and *I* set the world record in the mile, at 204 mph! In fact, my brother also set a record, in the kilometer, that same day, also at 204 mph. Speedy was on board for both records. Thanks as always, Speedy and James! Sweet ride, James! Congratulations to all. James, if you ever make it to Alamogordo, NM, you can photograph Speedy on the tombstone of HAM the Space Chimp. James, congratulations on both yours and your brother’s Red Hats! The Two-club gains two very worth members.